In this released U.S. Navy handout, The Arleigh Burke-class guided-missile destroyer USS Fitzgerald (DDG 62) sits in Dry Dock 4 at Fleet Activities Yokosuka to continue repairs and assess damage sustained from its June 17 collision with a merchant vessel. This view shows damage above the waterline to the outside skin of the ship. 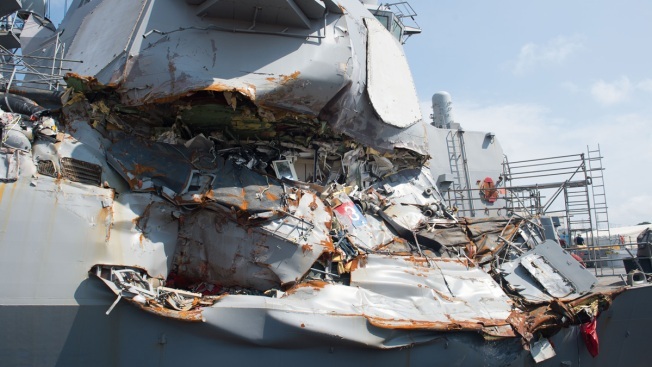 Charges are expected to be dropped against two former USS Fitzgerald officers accused of negligence in the 2017 destroyer collision that killed seven sailors, a U.S. Navy statement said Wednesday. Former USS Fitzgerald commanding officer Cmdr. Bryce Benson and former crew member Lt. Natalie Combs will receive letters of censure, but charges against them will be withdrawn and dismissed, the Navy statement said. Letters of censure acknowledge acts of wrongdoing but have no legal ramifications, NBC News reported. "This decision is in the best interest of the Navy, the families of the Fitzgerald Sailors, and the procedural rights of the accused officers," the Navy's statement said. "Both officers were previously dismissed from their jobs and received non-judicial punishment,"
The USS Fitzgerald collided with a Philippine-flagged merchant ship on June 17, 2017, in Japanese waters about 56 nautical miles southwest of Yokosuka, where the U.S. has a naval base. The bodies of seven U.S. sailors were found in flooded berthing compartments of the destroyer the next day.